Nothing can make me like LeBron James. I don’t care if he is a champion now. 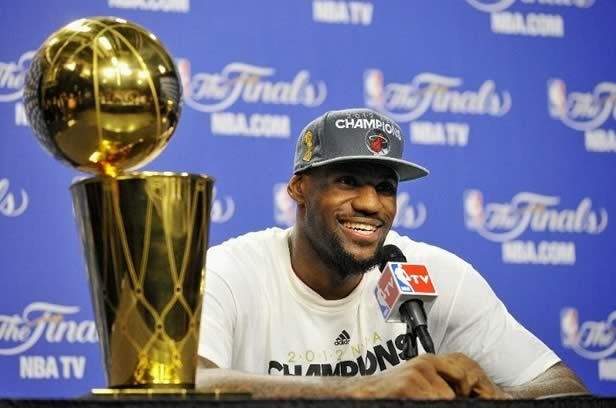 I don’t care if he is the NBA Finals MVP. I don’t care if he put up one of the greatest playoff performances ever this year. I don’t care if he helped Shane Battier get a ring. I don’t care if he overcame the worst cramps in human history to do it. I don’t care if he’s humbler, happier, and more mature than he was two years ago. I don’t care if spends his off-season saving small children from burning buildings. Nothing can make me like him. Is choosing teammates worse than inheriting them? I don’t want to be put in the position of defending LeBron James. As I’ve said, I’m not happy about his decision—it’s basically a sports tragedy. So while I generally agree with those criticizing him, I can’t help but notice some unfair attacks. Most of these deal with claims about LeBron’s personality. Fans have a tendency to do this a lot: They project personality traits and character flaws onto athletes based on no real knowledge of the players as individuals. If a player strikes out in a key situation, he must be unable to handle pressure. If a basketball player misses the open man, he must be a selfish person. If a football player happens to be the quarterback of a team that loses, he must not be a motivated individual. In a few instances, there is some merit to this—sports would not be nearly as special if it didn’t give us insights into the human psyche. LeBron James’ Decision generated all kinds of fallout last week, and not just among those burning jerseys and writing insane open letters in Comic Sans font. Joe Posnanski was mostly upset for not seeing it coming, and added some thoughts on Gilbert’s letter. Bill Simmons listed a torrent of angry emails about the decision, and in a podcast with Dan Le Batard, called it the cruelest thing any athlete had ever done to a franchise (meanwhile, Miami writer Le Batard was one of the only people to defend the decision). Will Leitch said it actually made being a sports fan feel stupid. Cleveland native Scott Raab took aim at ESPN. Brian Windhorst broke down how the new Big Three came together–a Big Three, by the way, that “breaks the linear equation” for certain Expected W-L formulas. Critically beloved The Daily Show allegedly has a problem with women, to which the women of the show responded. There may be something to the criticism, though, but only because women are not funny. Chris Jones’ investigation into Terry Kneiss’ incredible Price Is Right bid is terrific if inconclusive. At least it explains Drew Carey’s Buck-like lack of enthusiasm. Apparently, all rock stars are not that rich. “Irresistible”? Yes. “Teenage nonsense”? Never! It isn’t often that a player is accused of being selfish for taking less money in order to win championships. It isn’t often that a player is accused of being self-aggrandizing for holding a special that donates all proceeds to charity. It isn’t often that a player is accused of letting an entire city down after pretty much single-handedly leading his team to consecutive 60-win seasons. But then again, LeBron James isn’t a normal basketball player, so comparing him to what “often” happens probably doesn’t make much sense. There was something undeniably disappointing about the way LeBron’s decision played out yesterday. Maybe it was because of the slow, gradual, yet inevitable way it all played out: It went from possibly Miami, to probably Miami, to almost certainly Miami. By the time LeBron actually sat down for his interminable interview with Jim Gray, the outcome was all but certain, even if everyone was hoping that LeBron would justify our collective denial. 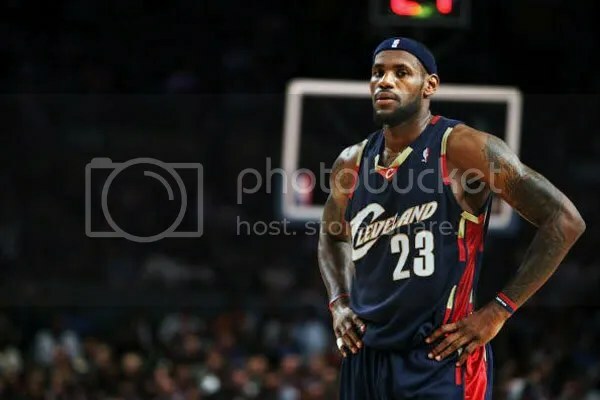 But it’s hard to see it being as disappointing if the gradually leaking information had all indicated that LeBron would return to Cleveland, or even that he would go to New York. No, there was something uniquely disappointing about LeBron signing with Miami, just one day after Dwyane Wade and Chris Bosh announced their plans to play in South Beach. What ever happened to LeBron James? Remember old LeBron? You know, Cute, Innocent LeBron? The LeBron who covered up his tattoos when he played on national television for his high school team while appearing on the cover of Sports Illustrated? The LeBron who was ruled ineligible because he accepted all those gifts and then allowed to play because the game was supposed to be on TV? Yeah, where’d that selfless LeBron go?